There are many simple things in life that we all take for granted. Having light at the flick of a switch, information at the click of a mouse, and a nice hot shower to name a few. When these relatively simple conveniences do not function as we wish, we are reminded once again as to how nice they make our lives. In the case of the hot shower, there are a few things that can go wrong. The most common problem is that they simply do not shut off all the way and leak or drip a little. This will not be cause for too much concern, as it doesn’t affect your hot shower in any way. The most annoying problem always has to do with the balancing spindle. The balancing spindle is located inside your shower valve along with the on/off cartridge. Depending on what manufacturer you have, it is either all one piece with the cartridge, or it is separate from the cartridge. 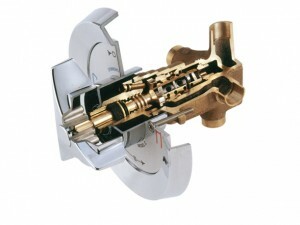 Companies such as Delta and Moen incorporate the balancing spindle right along with the on/off mechanism. Other companies such as Kohler, American Standard and Pegasus, have balancing units that can be taken out and replaced separately. The function of the balancing spindle is to prevent those dreaded toilet flush, scalding shower scenarios. On earlier tub/shower valves, when the cold water had a pressure drop, from a flushed toilet for example, the temperature could potentially become scalding. This is because the ratio of hot and cold gets thrown off due to the lack of cold water feeding the valve briefly. A newer pressure balanced tub/shower valve will not allow this situation to happen. It has an internal “spindle” that can freely glide back and forth, and compensate for any pressure differentials. Eventually, just like anything else plumbing related, this spindle can go bad, and usually get stuck. When it gets stuck or goes bad, one of two things usually happens; there will either be little to no water coming out of the valve, or it will vibrate your pipes so bad you will think there is a jackhammer going off somewhere in your house. If your shower is not performing the way you’d like, or it is performing a little too well (making music in the walls), give us a call so you can start enjoying your shower once again!